Illustrated in color in Samurai Stars of the Stage and Beautiful Women: Kunisada and Kuniyoshi, Masters of the Color Woodblock Print by Hatje Cantz, Museum Kunstpalast, p. 191. There is also another very small colored reproduction of this print on page 270, #169. Part of the text of this entry states: "This sheet shows the last heroic feat by the historical Hayashi Hanshirō Taketoshi. 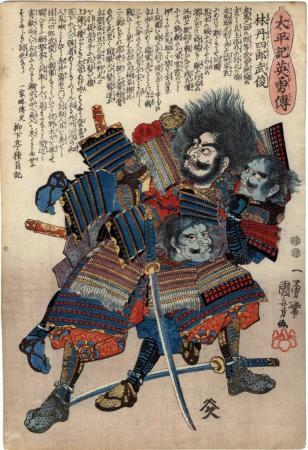 We see how he simultaneously strangles two opponents during the battle of Uchideno Hama. That same day, he fell at the side of his commander, Akechi Mitsuharu, an opponent of Toyotomi [Hideyoshi]."